As part of a campaign to raise awareness of human trafficking, Gwinnett County (Ga.) Public Schools supplied and wrapped 72 of its buses, each intended to represent 50 of the 3,600 children who are trafficked in the state each year. Seventy-two buses. Over 9,000 drivers training in one state. And thousands more pupil transporters in additional states planning to tackle a “problem too big to ignore” — human trafficking. January was Human Trafficking Awareness Month, and to mark the occasion, a Georgia school district took part early in the month in a campaign conducted by a nonprofit organization, Street Grace, that combats child exploitation. Gwinnett County Public Schools supplied and wrapped 72 of its buses, each intended to represent 50 of the 3,600 children who are trafficked each year in the state, with messages to raise awareness of the issue. Street Grace also made a powerful video that highlighted Gwinnett County’s buses and their role in the campaign. Meanwhile, the school transportation world is not ignoring this problem by any means. Busing on the Lookout (BOTL), an anti-trafficking awareness and training program, has recently taken hold among pupil transporters. The program is headed up by Truckers Against Trafficking, an organization dedicated to educating and mobilizing members of the trucking and busing industries around the issue. Last summer, the state of Iowa implemented the new training program to spot human trafficking victims. Completing the program is now required for the state’s 9,000 school bus drivers. 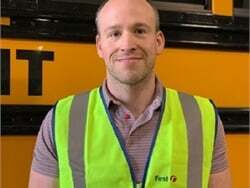 Max Christensen, an executive officer for school transportation at the Iowa Department of Education, said in an interview with SBF in August that the state first learned of the program at the Iowa Pupil Transportation Association’s 55th Annual Transportation Conference and Trade Show in July. Transportation directors from more than 160 of the state’s school districts attended the conference and agreed on the program’s benefit, he added. More recently, school bus drivers in Ankeny, Iowa, participated in an anti-trafficking class on Feb. 2, WHO TV reported. Additionally, the Wisconsin Department of Justice created a Human Trafficking Bureau in 2017, and has held training sessions with the transportation, hospitality, and health care industries, Julie Braun, a policy advisor with the agency, told Wisconsin Public Radio. The state’s Department of Justice plans to do a series of trainings with pupil transporters this year, including regional safety meetings for the Wisconsin School Bus Association in the spring, according to the news source. She added that drivers may pick up on signs that no one else can, such as someone suspicious waiting for a student at their bus stop, or talk from a student about an older boyfriend or girlfriend. School districts and pupil transportation associations in other states are also taking action by empowering their school bus drivers to recognize this problem with BOTL training. Those include Arizona, California, Colorado, Illinois, Maine, Michigan, Montana, Nebraska, Nevada, South Carolina, Tennessee, and Wyoming, Annie Sovcik, the organization’s program director, told SBF. Wisconsin-based school bus operator Go Riteway is also providing the training to their 1,400 drivers and other staff members. They are joined by a handful of other school bus companies nationwide, according to Sovcik. 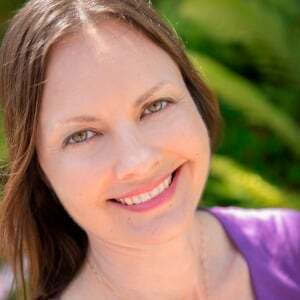 “The receptivity has been really inspiring,” she added. This commitment to raise awareness of trafficking is a good reminder of how connected drivers are to their communities, and how crucial they can be to stopping or even preventing these crimes. The manufacturer of medium- and heavy-duty automatic transmissions purchases the EV systems divisions of Vantage Power and AxleTech. The 6-year-old student runs to the side of the bus as it is departing her school in an attempt to stop the driver, but falls and is pulled underneath the bus. 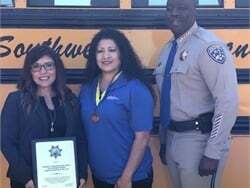 Salena Torres is given the North Region School Bus Driver of the Year award by the California Highway Patrol and the California Department of Education for the November incident. Frank Naelitz of Ohio is named one of the Auto Care Association’s World Class Technicians. Student Transportation of America continues its annual tradition of expressing appreciation for its dedicated employees. The Alabama driver reportedly skips students’ bus stops due to disruptive behavior. He is let go for not following proper protocol and demonstrating poor student management. 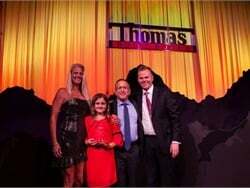 Matthews Bus Alliance Inc. is named Dealer of the Year for the school bus OEM. 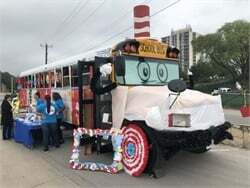 Check out photos of a San Antonio Independent School District's school bus that the transportation team fashioned into the likeness of the well-known character from a story by children's author Dr. Seuss. 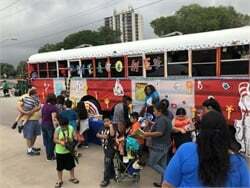 San Antonio Independent School District transforms one of its school buses into the likeness of the main character from the Dr. Seuss book for a district event highlighting summertime activities. 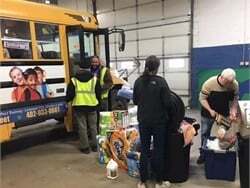 About 150 employees in Omaha took part in a “Stuff-the-Bus” event, donating and collecting items for those affected by the major flood disasters in the state. The 7-year-old student is crossing behind the stopped school bus when a van behind the bus hits him, pinning him against the bus. 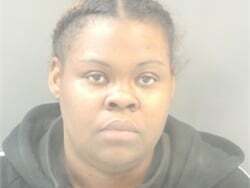 Ty’Andra Williams and Tiffany Pruitt of Missouri allegedly board a school bus and beat the driver over a student’s claim that the driver told another student to jump on her. House Bill 1255 would establish the state’s Zero-Emission Vehicle School Bus Transition Grant Program to provide funding for electric school buses. Know a contractor who deserves recognition for his or her efforts? 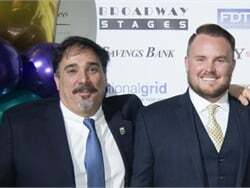 We’re accepting nominations for SBF’s 2019 Contractor of the Year award. 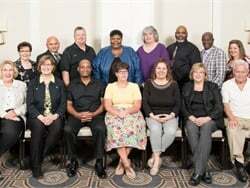 Location managers for the school bus contractor nominated employees for the honor, which highlights safety performance and extraordinary character. Get the latest news and most popular articles from SBF delivered straight to your inbox. 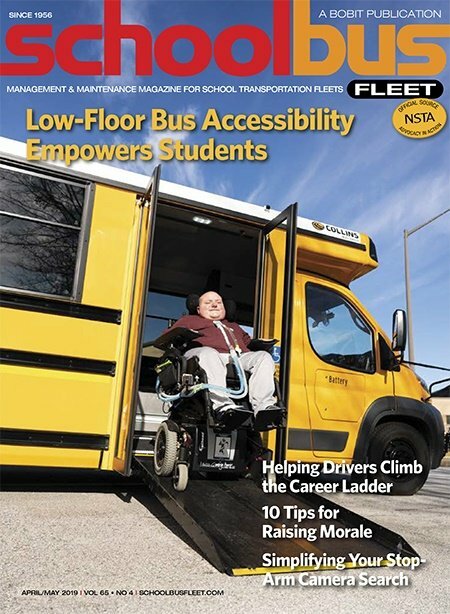 Stay on top of the school bus industry and don't miss a thing!